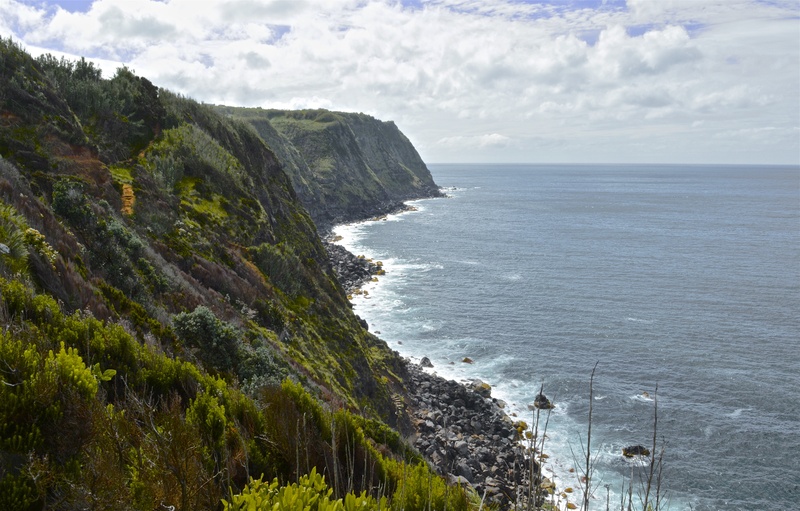 The Açores (Azores) are known by many as the “Hawaii of Europe”. That’s a little unfair of a comparison, as it’s not quite the same, and they are definitely unique to themselves, but I do get the comparison. My in-laws live on the largest of the 9 islands, São Miguel, where my wife was born, so that’s where I spend all my time. It’s an island of endless miradouros (viewpoints). Steep green cliffsides, broad ocean views, bright flowers of several varieties, and cows… lots of cows! There’s way too many miradouros on São Miguel to list, but here’s some of my favourite ones aroudn the island. 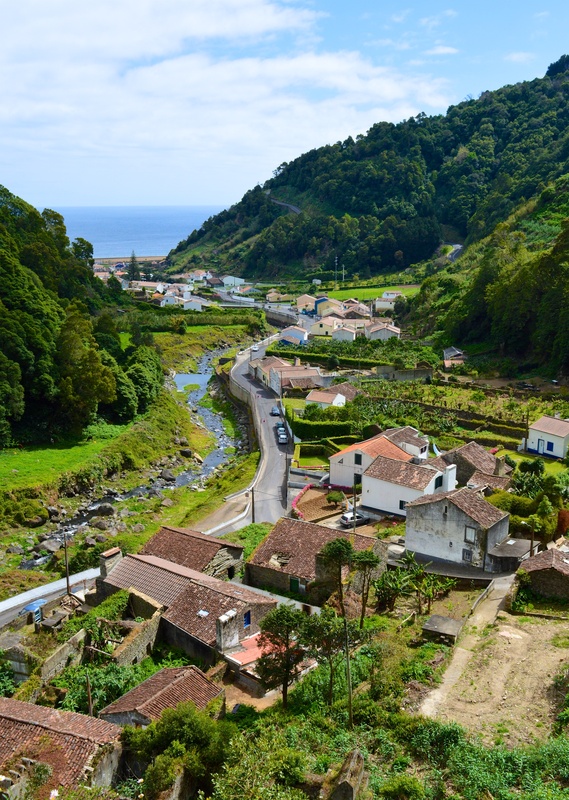 ‘Way out in the far Northeast corner of São Miguel, you’ll find the small farming town of Lomba da Fazenda (the name literally translates to ‘farm town’). 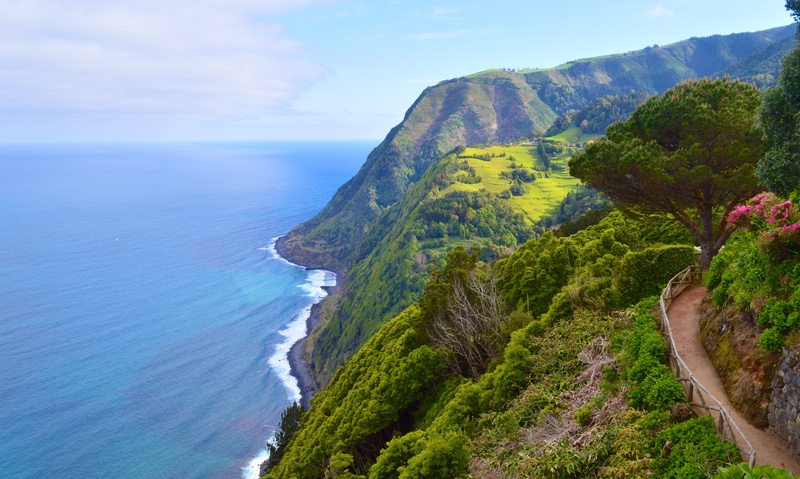 The Nordeste region of the island definitely has some of the absolute best viewpoints, as it’s more ‘wild’ and has far less visitors than the western side which is closer to the capital city of Ponta Delgada. Fazenda is where my sister-in-law and her family live. It’s the same house where my wife and all her siblings grew up before moving to Toronto, and it’s the town where we go to visit family, relax, and take in the beauty of the island. From the centre of town, walk down the long road where the cemetery is, towards the ocean. After going around a few bends and past farmers fields, you’ll come to a dead end at the cliffside. This is the Miradouro do Pelado. There’s a nice little shaded area with a stone picnic table and benches to sit and enjoy the view. You can also follow a dirt trail down the cliffs to the rocky shore below to see the crashing waves… just be careful not to fall in! I’m sticking with region of Nordeste theme for a few of these because I truly believe this is where some of the best viewpoints on the island are. Driving Southeast past the Vila do Nordeste (the main town in the region) you’ll come to a small parking are just above the steep, winding road down to the Farol (lighthouse) do Arnel. You might be tempted to drive down, but I’d say just don’t bother… yes, it’s a killer walk back uphill, but with about a 35˚ incline, it’s not worth your car getting stuck down there! Don’t be lazy… walk down. You gotta earn the views anyway. Just make sure your knees are in good working order! One thing to watch out for is that this isn’t the actual Miradouro do Ponte do Arnel that’s listed on maps… you actually drive past that, to the road leading down to the lighthouse itself. Once you walk down the hill, there’s are two spots close to the lighthouse (one before, and one after) that give you two different viewpoints that are both spectacular. The view closer to the bottom not only gives you some dramatic cliffs to gawk at, but also a tall waterfall hiding around the corner. Staying in Nordeste, drive south about 10 minutes from the Arnel lighthouse and you’ll get to one of my absolute favourite spots on the island. The Portuguese love their miradouros, as they can be found all across the country, but the Açoreans certainly take it to the next level, as many of them are set up as small park and picnic areas. The Miradouro Ponta do Sossego is fully equipped for a nice day out with family and friends. Well maintained gardens, cliffside trails, old stone BBQs, covered stone tables and benches, and the most spectacular view that will make you feel like your in Jurrassic Park. There’s also a secret little extra spot that I really love, that I’m not telling you about because the increase in tourists has already led to some of our favourites being ruined by too many crowds of people! Ok, last one I’m listing in Nordeste. Drive a little further south from Sossego, just across the next valley… down and back up again, and you’ll hit Ponta da Madrugada. In my opinion, the overall view from this one doesn’t leave you as awestruck as Sossego does, but the one thing I love here is the view you get from the parking lot when the hydrangea bushes are in full bloom, and you can look through them out to the ocean. 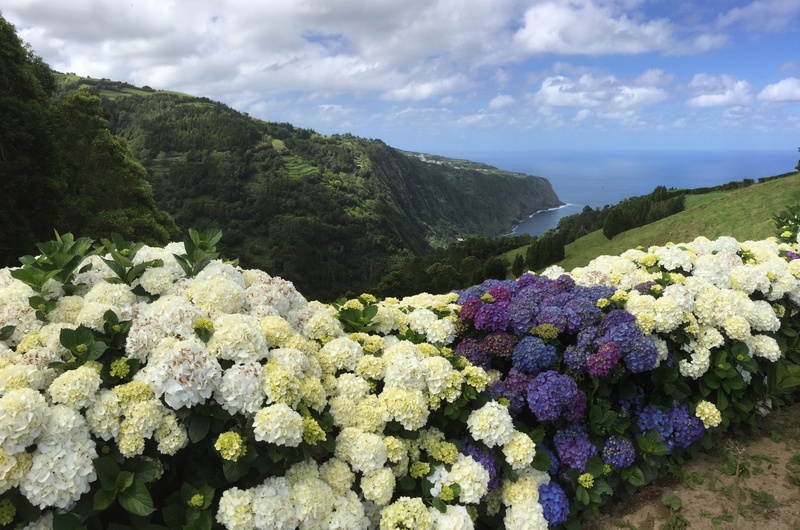 If you’re driving around the island any time from the beginning to the end of summer, you’ll see why the hydrangea is a symbol of pride for Açoreans, and this is a really great spot to see them! 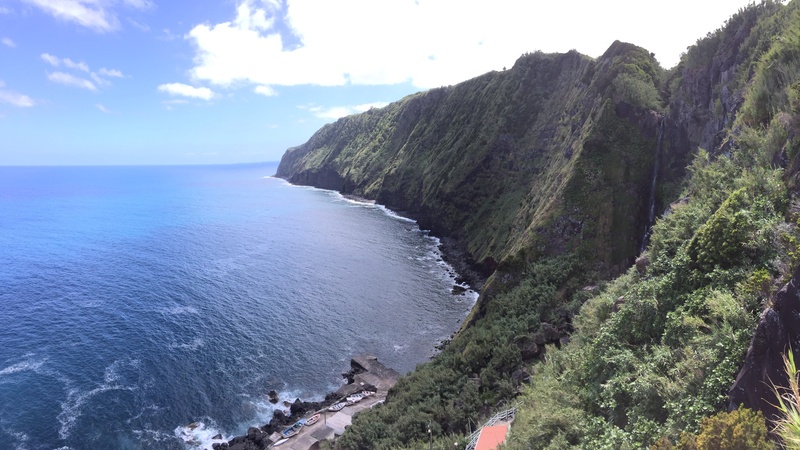 View over Faial de Terra from the beginning of the Salto do Prego trail. Down in the southeast corner of the island, in the region of Povoação, where settlers first landed on São Miguel in 1427, is the tiny town of Faial de Terra. It runs along a small river from the ocean to the mountains. This viewpoint doesn’t have name, because it’s actually near the beginning of the 4km (8km round trip?) mountain trail that leads to the Salto do Prego waterfall… which is why i just titled it after the trail itself. Drive through the town and up the hill to the parking area near the charmingly abandoned ruins of an old settlement. Start walking up. Yeah… up… up.. up… up more. It’s exhausting. At this point you’re still on paved road, but there’s absolutely no way in hell that a car is getting up there (although, Açoreans seem to constantly surprise me with the gravity-defying things they manage to do with vehicles). Somewhere along the winding road up to the top, stop… turn around and enjoy the absolutely amazing view through the valley overlooking the town of Faial de Terra all the way to the sea. Once you’ve caught your breath, please do the entire trail through the mountains… it’s long but it’s more than worth it, as at the end, you’re treated to a magnificent waterfall and cold water pool you can swim in, right in the middle of the mountains. Don’t forget though, you still have to walk back! Back on the north side of the island, close to the larger city of Ribeira Grande, is a unique viewpoint in the sense that you can see quite a ways in both directions (east and west). The Miradouro Santa Iria is another great spot for a picnic, as it’s well set up for an afternoon out. Just on its eastern side, there are some hidden terraced garden areas that have stone tables to sit at if you want some privacy away from the other tourists taking photos. This miradouro is also one of the best spots for a magnificent sunset view. Since the Açores are volcanic islands, they are famous for their crater lakes. Most visitors to São Miguel know about Sete Cidades (which will be listed below), as it’s on pretty much every single tourism photo of the island, but my favourite is Lagoa do Fogo, more in the centre. It’s higher up and has a certain mystique to it. Driving up the mountain, the fog seems to roll over, and the landscape turns to something you’d envision may be on another planet. This used to be my “secret spot” until it’s become more popular with tourists and now the small parking area seems to be packed all the time. However, this led me to discover another ‘secret spot’ that offers an even better viewpoint than the main one that overlooks the lake. Susete and I parked our car further up the road where almost no one is, and although the walk was further down to main spot, we were lucky enough to find a really amazing viewpoint that offers a slightly different perspective, as it’s a little higher up, and you feel like you’re more in undiscovered territory. Make sure to walk the trail that leads down to the lake itself… it’s a great spot for a picnic and a swim in the lake. Just please don’t leave any garbage! Also be warned… the train down is awesome… the trail back up is killer! ** You can actually follow trails running all the way around the crater if you’re up for a 11km hike! Traditional Sete Cidades viewpoint… shot taken from the rooftop of the abandoned hotel. 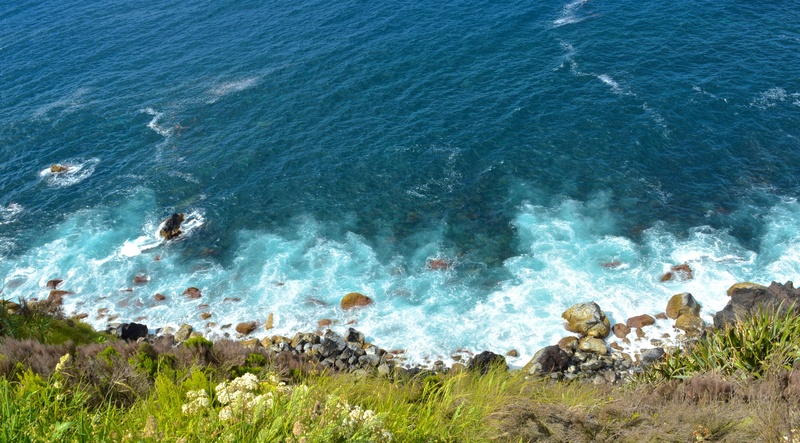 My favourite spot, at the miradouro do Boca do Inferno… on the road by Lagoa do Carnário. This one is was already famous before the Açores were famous. Sete Cidades, with it’s two lakes (azul and verde) have been the touristic postcard shot of the island forever. It is spectacular and worth a stop, don’t get me wrong, but it’s just way too crowded now, which does take away a bit from the “being in nature” feeling of it all. Even the secret alternate spot that is here, is no longer a secret, as it’s every single blog you can find. The abandoned hotel beside the miradouro is actually freely accessible to anyone (no safety barriers anywhere, so be careful), and the rooftop offers a better view over the lakes than the viewpoint itself. 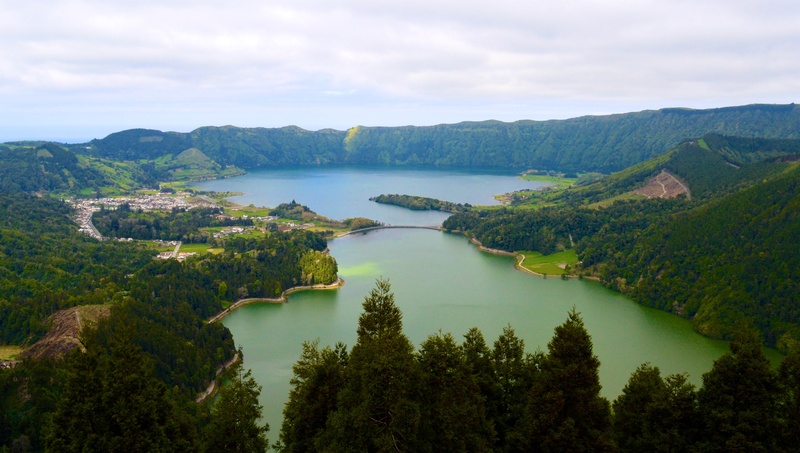 However, the Sete Cidades area is actually quite a bit more than just the two main lakes. My favourite spot is one that is now too starting to become overpopulated by Instagramers. 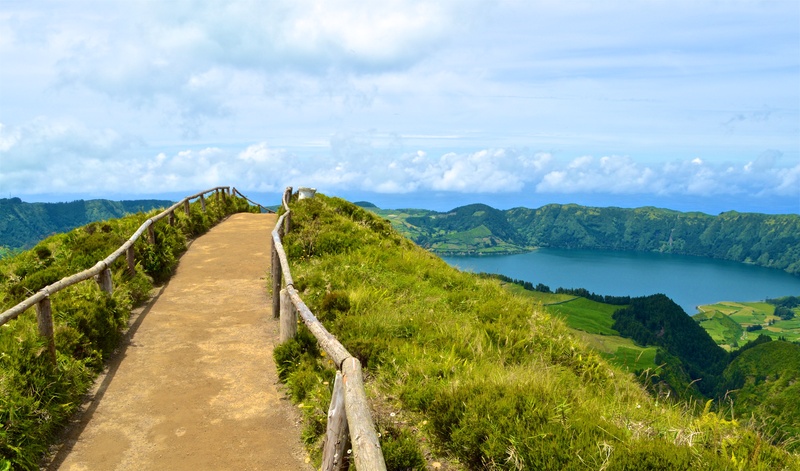 Close to Lagoa do Carnário is a trail that leads to a different perspective of the Sete Cidades craters, with a viewpoint overlooking Lagoa Santiago and then onto the two main ones. It really is one of my favourite viewpoints on the island, in spite of the new crowds that go with it. Once again though, the increased number of people led Susete and I to try to find alternative routes, and that we did! This is one time it’s worth it to branch off the main trail, brave out over the mountains and gain a totally different view. What makes this “new alternate” so great though, is the lack of any other single soul, so if everyone starts going there, then it will also be ruined… not to mention all the unique and fragile vegetation that will be trampled.. so better just stick with the other tourists then. Founded in 1874, and still with the same family, Fabrica de Chá Gorreana is the only commercial tea plantation in Europe. There is another one (Chá Porto Formoso) just down the road, but they don’t export to other countries, or even to the mainland at all. This isn’t a miradouro in the traditional sense, like the others, but it’s worth putting on the list because there are really unique and spectacular views here. “Tours” are offered, but it’s actually completely self-guided, as you just wander through the tea factory at your own free will, around workers trying to do their job. There’s also a store there where you can (and should) buy tea to take home. It’s one of my favourite teas. 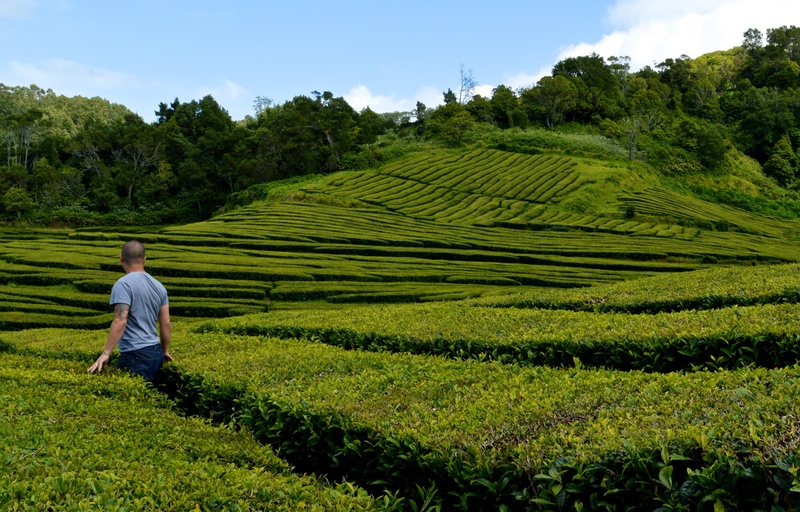 The real winner though, is the walk through the tea fields themselves, which you’re also allowed to do without any supervision whatsoever. There are a couple dirt trails that run through the fields to give you an up-close look at the plants, and a really great view of the terraced quinta (garden). There’s really nothing like it anywhere else! Just please remember that you’re a guest, and to be a responsible tourist… leave the plants alone!